Following up on my initial For Sale post here, I finally have some new 3d-printed Fiesta items to offer that I've put a lot of work into. All these items I model, test fit, and print myself in my free time and are made from durable PETG with attention to detail. I'm hoping that merging my two favorite hobbies --driving/modding the FiST and 3D printing-- provides something useful back to the Fiesta community. I plan on adding more to offer in the future. All orders include a free ST keyring. Take $5 Off your order when you purchase at least one of each item. Shipping is $7.00 flat (US 48 states) and I can combine items in the same package at no additional cost. Items are available in Black or Red as shown below. Other colors available at request are Dark Blue, Gray, and Purple. If no request is made, items will be shipped as pictured. Please send PayPal payment to: JT@RAZZTER.COM and include your username in the comments. Turn the (formerly) "useless" cubbyhole into usable space. Wallets, sunglasses, keys, and more! Amazing!.. Perhaps the most common complaint about the Fiesta besides the over-dampened rear struts is that silly cubbyhole under the A/C controls. This piece for sale attaches snugly into the cubbyhole using poster tape (included) and sticks out about 1.5 inches, just about doubling the space of the cubbyhole while still staying plenty clear of the shifter. An upward angle and open face means you can securely fit many more things. It is designed to perfectly contour to the curves for a clean look. Putting stuff in that space actually becomes kind of enjoyable. Tip: When installing, first check fitment, then remove the adhesive backing then slide it in to the back while pressing down in the center. With your fingers, apply firm pressure along the back for a good grab. Make sure the contact area is free of oil. Hang your keys in style with your own reserved spot on the wall. This keyfob hook attaches to your wall with poster-tape (included) and gives you a special spot for your keys. Two-tone in red and black (other combinations available on request) and emblazoned on the inside with the 'ST' logo and a contoured design. It's design utilizes the two dimples on either side of the fob so that only the Ford FOB can be attached and other fobs won't fit on it, so no one else can take your spot on the wall! Unless of course they also have the same Ford fob.. 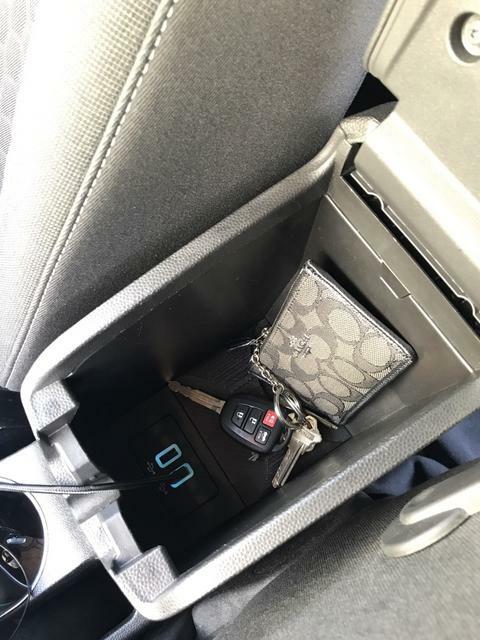 Easily remove small items from the bottom of your center console with this removable cup insert. Fishing out loose change and small items from the bottom of my FiST's center console is super annoying, so I took it upon myself to 3d model and print this removable cup to make it convenient to store and remove stuff down there. It also features a finger-hold to be able to effortlessly grab and pull the cup out. It's a nice addition to the removable center console cup and fits right over top of it, and can be used with or without it. Fits snug with a raised finger-hold for easy removal and 'ST' logo on top. Thanks for looking, comments and suggestions welcome. That's some quality work there ST88. i want a cubby extender! Do you know if the material warps if temps hit ~150f? I left a peak hold thermocouple in my car last summer and it went to 148 for a few hours. Yeah it can handle that temp no prob. paid, forgot to as for black. PayPal sent for cubbyhole extender. Edit: Forgot to mention, black please. Just to expand a little bit on my previous reply. It's a good question to ask, [MENTION=8822]Clit_Beastwood[/MENTION] The glass transition temp for this material is around 190F. Thats when the material will start to get soft and 190F should be well enough above the range of car summer temps for just about everyone. Further, I'll guarantee my parts so that if any warp due to heat, I'll send a replacement, just pay shipping. Thanks for taking the time! So far I've only 3d printed 1-2 things (pla) and looked like modern art after being left in the car. Yea PLA doesn't hold up AT ALL in cars in summer. I figured that out the hard way as well. PETG is much better. Shut up and take my money! The center box cup is a great idea. There's change and autocross time slips at the bottom of mine I'll never be able to get out. **Suggestion for your next product, if you're not already making one, and if you are I want one: pull-out cup holder liner! I have been using the console cup and lid since [MENTION=5208]SirThomas88[/MENTION] first made them. I believe it has been almost a year now and they are great. Dude thanks for making this stuff! I'd get that extender thing but it would cover my build number plaque. Suggestion on the console lid - it is a great quality piece for sure and super helpful. On future iterations you might turn the protruding "handle" part 90 degrees, it would make it easier for the driver to grab (yes, I own one). Again, great stuff, thanks, + rep for you!!!!!!!!!! Hey... that's a possibility! Let me think about that. Is that just to make it easy to clean? 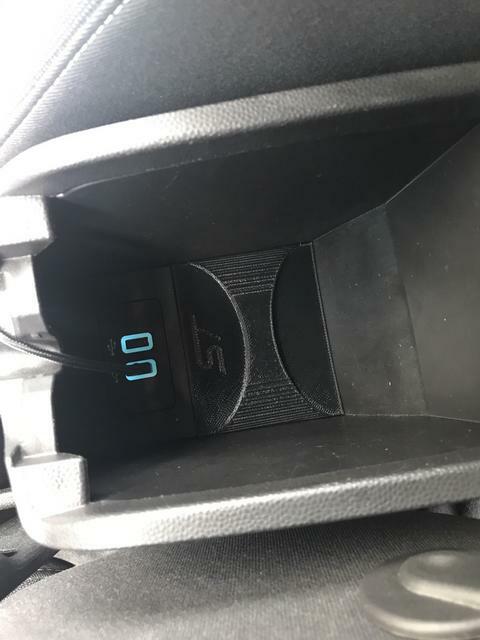 Do you think the liner go all the way up the sides of the cup holder to just below the light accent, or just sit in the bottom with a slight lip to catch liquids and debris? On the cup holder, I'd think just a raised lip that doesn't interfere with the spring-loaded cup grabbers. And make it one-piece so you could grab it by the middle "bridge" between the holders to pull it out and clean it. Paypalled you for the other stuff. Thanks! This! I can't tell you how many loose coffee cup lids or my kids juice things have made cleaning that it out a pita. Everything looks awesome! For the center console lid, here's how I pull it out with one finger. You may be doing it a different way than I do. Still, I think I'll add a slight overhang to the handle to make it even easier. If you're interested in the cubbyhole extender, I bet I could make you one with a cut-out so it doesn't cover your plaque. I would just need the dimensions of the plaque (mm) and it's placement (how far back from the front edge it sits, picture with a ruler would help).